NEW DELHI – Indian Prime Minister Manmohan Singh ruled out Wednesday any change in the status of Kashmir and indicated that he would not agree to a redrawing of India’s borders with Pakistan as a solution to the long-disputed territory. Pakistani President Gen. Pervez Musharraf suggested last month that parts of Kashmir, now divided between Pakistan and India, be demilitarized, placed under United Nations mandate or under joint control. "I have made it clear to President Musharraf that any redrawing of the international border is not acceptable to us. Any proposal which smacks of further division is not going to be acceptable to us," Singh revealed at a nationally-televised press conference in Srinagar, the capital of the Indian-held part of Kashmir. The Indian premier’s announcement would come as a disappointment to Musharraf, who has said publicly that he viewed the Line of Control (LoC) that divides the Indian and Pakistani controlled parts of the divided territory as the problem and not the solution to the Kashmir issue. 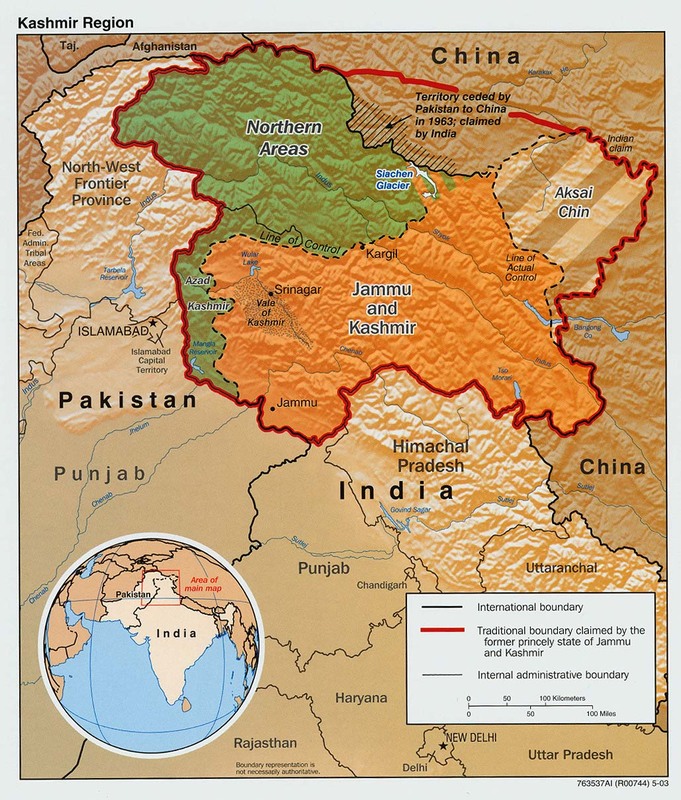 Pakistan was hived off from a larger India on independence from Britain in 1947 as a separate homeland for the subcontinent’s Muslims, but the deal did not include Kashmir, which had a Muslim-majority population but was ruled by a Hindu king. Since then, the alpine territory  famed as a tourist destination for its blue lakes and snow-capped peaks  has been the cause of several wars fought between Pakistan and India, the latest at Kargil on the LoC in 1999. The LoC, monitored by a United Nations group, was first drawn up where the troops of the two countries fought each other to a standstill in 1949. It was frozen after a war in 1971 war that also resulted in the creation of Bangladesh. In 2002, the South Asian neighbors, nuclear-armed since 1998, hovered for months on the brink of yet another all-out war with close to a million troops amassed on either side of their common boundary until international diplomacy successfully defused the crisis. As a result of the Kargil war and the nuclear-tipped standoff in 2002, international opinion has veered around India’s view that the best solution to the Kashmir issue would be the gradual conversion of the LoC into a formal border. The two countries have, after a rare rapprochement during a regional summit in January, begun a "composite dialogue" process that includes moves to settle the Kashmir issue through a calibrated and slow process. The confidence-building measures include improving trade and cultural relations. Singh’s trip to Kashmir, the first since he took over as prime minister in May following the electoral victory of his Congress Party, was carefully planned. Congress also backs the provincial government in Kashmir and this has made things easier. In Srinagar, Singh unveiled a $5.5 billion "economic revival plan" and said at least 24,000 jobs would be created in Kashmir. The Prime Minister also announced at a public rally that his government was willing to sit down and talk unconditionally to anyone, including militant groups, provided they were willing to give up violence. "We will talk to all those who have concerns for the Kashmiris. My doors are open to those who want to meet me and talk peace, and I have no conditions except that their intentions are genuine," Singh, who was born in what is now Pakistan, said in fluent Urdu, the language spoken by the majority of Pakistanis. Ahead of his visit, Singh announced a reduction in troops deployed for counter-insurgency operations in the Kashmir valley. These troops have also been accused of committing gross human rights abuses. But despite the upbeat tone, the visit skirted disaster when a deadly gun battle erupted at the scene of the rally and continued as Singh’s flight landed in the urban hub of anti-India Muslim militancy. The prime minister had to be barricaded behind a heavy bulletproof glass enclosure. The gunfire was quickly silenced after security forces engaged and shot two of the militants dead. The visit was also marred by a boycott of Singh by the All-Party Hurriyat Conference (APHC), an umbrella organization of political parties, most of which are seeking independence for Kashmir  although some are openly calling for a merger with Muslim-dominated Pakistan. APHC leader Mirwaiz Omer Farooq, who had initially said that he and his colleagues were ready to meet Singh, suddenly announced on Tuesday that any meeting with the prime minister could happen only after they were first allowed to meet militant leaders in Pakistan-held territory. Despite his firmness that the contours of Kashmir, as they now stand, cannot be changed, Singh said his "mind is open to new ideas." Singh reiterated that India would continue the current composite dialogue with Pakistan on condition that Musharraf sticks to a promise he made on Jan. 6, in Islamabad, that Pakistani-controlled territory would not be allowed to be used for militant activity. So far, the promise has been kept, and the premier before his departure for Kashmir said troop withdrawals had become possible because of a marked lowering in the incidence of infiltrations across the LoC this year. Yet, Syed Salahuddin, commander of the Hizb-ul-Mujahideen group that is based in the Pakistan-controlled part of Kashmir, made it known to Singh’s entourage that his group would not be satisfied unless there is a complete withdrawal of Indian troops from the disputed territory. Kashmir is likely to come up for discussion between the two countries next when Pakistani Prime Minister Shuakat Aziz arrives in New Delhi on Nov. 23.